Happy 8th Birthday to my lovely son!!! Chocolate cake, layered with chocolate mousse, topped with chocolate ganache and white chocolate curls, yes, all vegan! 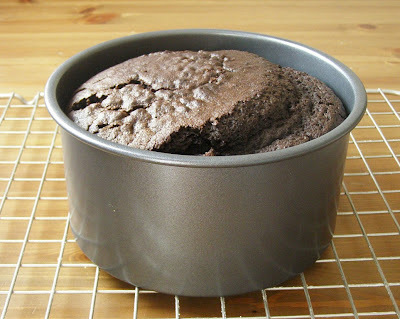 Preheat oven to 180C / 350F and line the bottom of a high sided 7 or 8" non stick cake pan with a removable bottom or springform sides. Combine all the dry ingredients in a large bowl. Mix together all the liquid ingredients separately. Make a well into the dry and add the liquid and whisk until it all just comes together. Pour into the prepared pan and bake for about 1 hour 10 minutes. 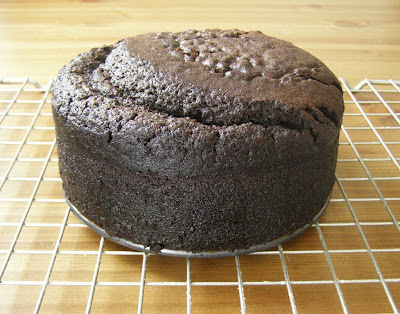 This cake normally just takes half an hour to cook, but as this recipe is doubled and being cooked in 1 pan, not 2, it takes a lot longer to cook. I had to cover it with foil after 1/2 hour to ensure it didn't over cook on top and had to keep checking it with a toothpick. Remove from the oven, place on a wire rack and let fully cool in the pan. Best to leave it overnight. Next day, remove it from the pan and if you have to, slice the top off so that you have an even cake. Although my top wasn't even I chose not too slice it off, with that crevice I ended up with I would have had to cut too much off, and it was sitting even enough so I didn't worry about it. Then carefully and evenly slice the cake into 3rds, placing all layers on the wire rack. 3 Tbsp Kahlua, yup, in my child's cake....oh the shame! 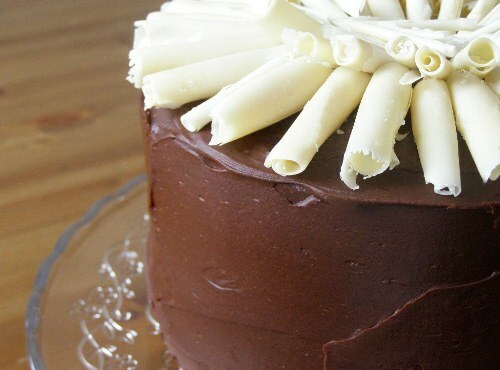 Melt the chocolate and set aside to get to room temperature. Whisk up the whipping cream with the icing sugar until light and airy. When the chocolate is still melted but no longer hot and more or less similar in temperature to the cream, whisk it in quickly. It's important to do this fast so that the chocolate doesn't seize up, it will also seize up if the temperature difference between the two is too great. Next whisk in the vanilla and Kahlua. 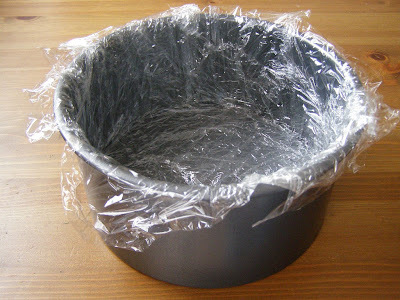 Take the pan that you baked the cake in and fully line it in cling film. Place the top 3rd of the sliced cake and place it upside down into the cake pan. Spoon over half the mousse and level it out. 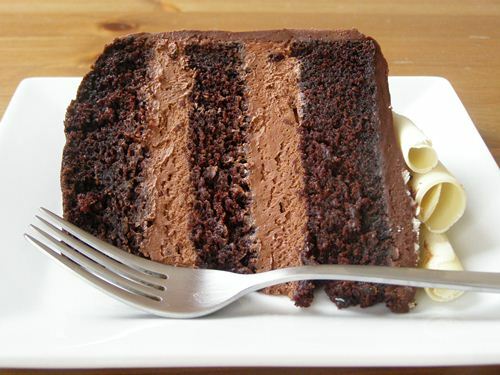 Place the middle slice of cake over top the mousse, then add the other half of the mousse. 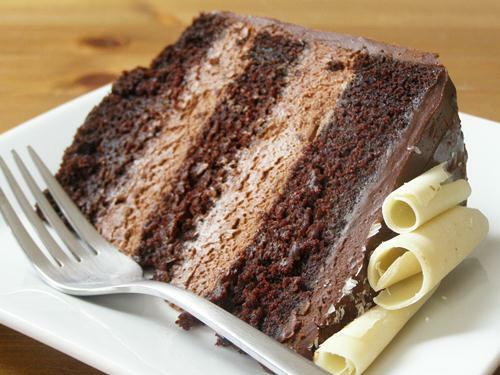 Now place the bottom slice of cake on top, or whatever slice has the smoothest top for you as this will be the top which you want as flat as possible. 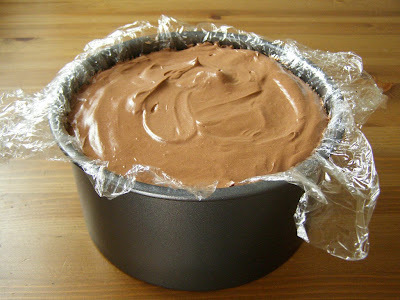 Wrap the excess cling film over the top, gently press down to get out any bubbles in the mousse, and add more cling film if necessary to fully cover the cake. 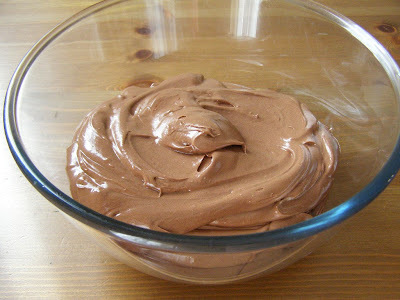 Place it in the fridge for the mousse to set - about 3 hours. 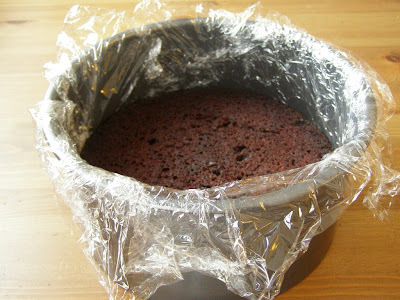 When set, remove from the fridge and gently pull it out of the cake pan by the cling film. You may notice some of the mousse sticks out a bit more than the cake. If it does take a palette knife and smooth the mousse all around so that it's nice and even. Finely chop the chocolate and place in a large bowl. In a small saucepan heat up the cream and fat until it melts and it all just comes to the boil. Quickly pour over the chocolate, leave it a few seconds then whisk it up until smooth and glossy. Whisk in the kahlua. Leave it out at room temperature, stirring now and again until it thickens up slightly. 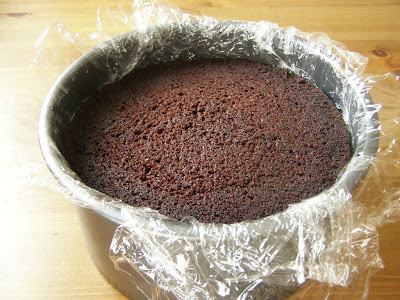 It will be too runny to pour over the cake right away, you want it pourable but thick enough that it will coat the cake nicely. 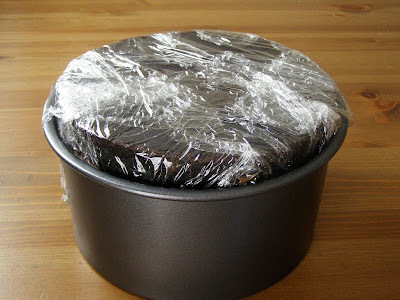 When it's ready, place the cake on a wire rack with some baking paper underneath to catch any drips. Now simply pour the ganache all over the top and using a palette knife push it over the sides and around the cake. When it is all covered check for any missing bits, or lumps and smooth it out. 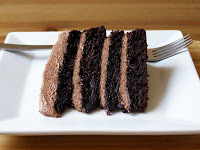 The ganache does start to set quite quickly, if it gets a bit too thick on the cake you can dip your finger in some warm water to smooth out any lumps or bumps. You will only use about 100g of white chocolate for the cake, but you will need to melt about 300g in order to make the curls. Melt the buttons in the microwave until smooth. Pour into a flat pan with small sides in a rectangular shape that you will be able to run a cheese slice over to get curls. I used a jelly roll pan but made it smaller with some foil, otherwise it would have needed even more chocolate to fill up! Pop this into the fridge to harden. To make the curls you will need to bring this back up to room temperature, if the chocolate is too hard you won't get curls, just shavings, and if it's too soft your curls will be too thick. You can see in my pictures that I ended up with both those and some just right - it's all experimental!! You simply run the cheese slice over the surface with good, even pressure, try a few and you'll soon realize how much pressure to use and how soft the chocolate will need to be. Once your curls are made simply place on top of your cake in whatever design you like. I opted for a circular fashion but I'm sure they would have looked good just piled on on top :) It's also best to place these on while the ganache is still soft so that they have something to stick too. Then, that's it! Two or three days later, your done! Now, servings, we first cut this into 12ths but found as it's so rich and sweet that they were too big, so 16th's or more would be best - the smaller the better really ;) Keep in the fridge and bring slices to room temperature before serving. Wow. Just wow wow wow. Your son is one very, very lucky kid!! I am seriously considering getting married just so I can ask if you would be interested in making the cake? Belated Bitthday wishes to your boy, I bet he was licking his fingers! Hope your son had a lovely day. this is so so special! well done! and thanks for the step by step tutorial, i love it! I'm *way* too lazy to make chocolate curls. 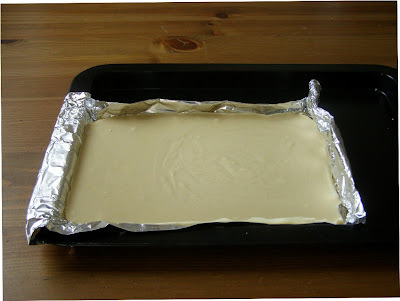 I've not tried the white chocolate buttons with them yet - were you able to make them easily without adding extra fat? 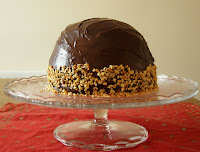 I received a kahlua mousse cake this year for valentines; it's definitely the way forward. Thanks Steven! Yeah, Kahlua mousse is the best!! I didn't add any fat or anything to the white chocolate. Just melted it and reset it. They curled fine with a cheese slice but it was a little tricky getting the temperature right. If it was too cold I just got shavings and if too warm the curls were too thick. I would say the white chocolate is soft enough to not need any fat, but am unsure about dark chocolate. Well, at least my new cheese slice has a purpose now! That cake is epic! I am so very impressed with your skills. Thank you for having such an amazing blog and posts. I would probably be lazy and use white chocolate buttons rather than curls, but otherwise I might try and replicate this following your excellent guidelines. Have been drooling over this for months, it's about time I finally made it! Thank you! Well Debbie, it took me a little while, but I finally made it! It was worth the wait! 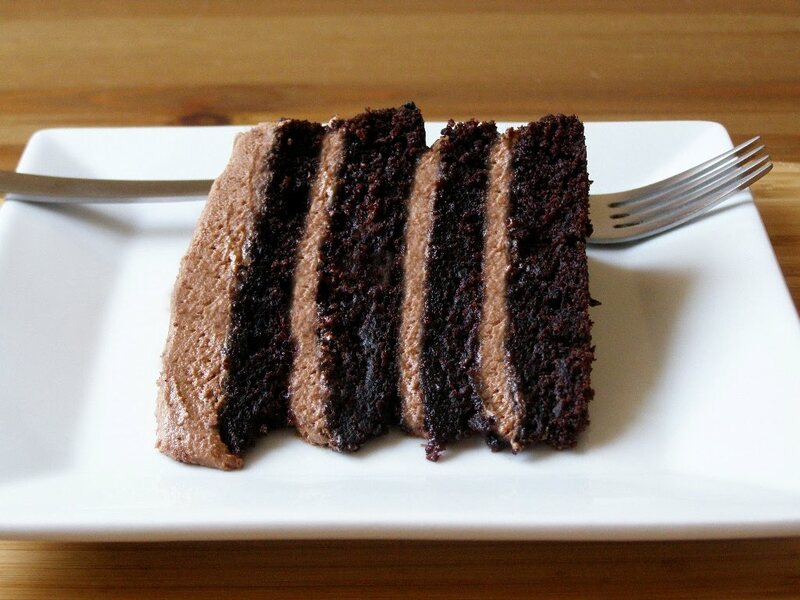 I have my own favourite chocolate cake recipe that I use, so I stuck with that. I don't have a cake tin as big as yours, so I used two, putting two thirds of the mixture in one (which I then halved) and the rest in the other. This also meant I had to chill the mousse first and then assemble once the mousse was chilled, rather than chilling the cake after assembly. 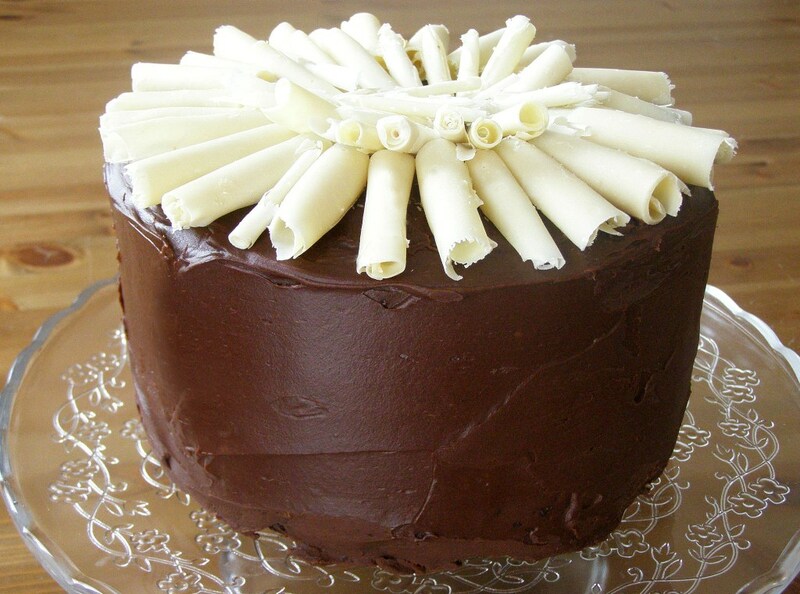 The ganache took quite a long time to cool before decorating, but worked a treat once it was ready. I didn't have enough white chocolate (or time, or patience) to make the curls, so opted for a simply strawberry garnish, and then served the cake with a side of berries. You can see the results on my flickr page (http://www.flickr.com/photos/veganbow/). Thank you so much for your inspiration and for sharing this wonderful recipe! I and the five other people I shared this with were in chocolate heaven. It was one of the most delicious things I have ever eaten, never mind made! oh and you are the best mom ever when it comes to birthday cakes! 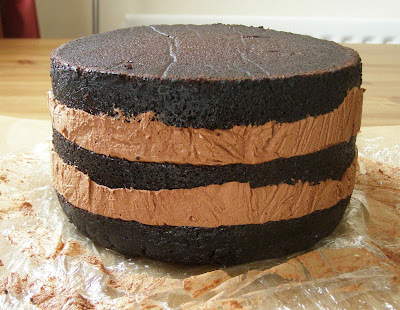 I don't have a deep pan like that, do you think it would work layering three separately baked cake sections iced together? http://www.maplespice.com/2009/05/quadruple-layer-chocolate-cake.html It was made using the same quantity of cake batter. Hi! I have just discovered your website and I love it! You are amazingly creative! I would love to make the chocolate mousse cake but don't know where to find the soya whipping cream. I live in Pittsburgh, Pa - I will start at Wholefoods in my search. Thank you for posting your wonderful VEGAN recipes! For the soya whipping cream I used one by Granovita which unfortunately seems to not be made anymore :-( I'm quite distraught about this!! Another company I can get here is Soyatoo, also in a carton (not a spray can) but I haven't tried it with my mousse yet. I hope you find a suitable replacement over there. In any case there are multiple recipes out there for tofu based mousses but I find they are never proper mousse like in texture like this one was. Still, should taste good! I just would like to check with you, there is no eggs in this recipe? Ugh, I am literally drooling on my keyboard right now. I am attempting to my my own variation of this cake, mixed with the 4 layer choc buttercream cake, and a few other little bits. I made this yesterday and it was AMAZING! (and is already finished heh). Every recipe I have tried from your blog has been delicious, thank you so much for sharing your recipes with us! This looks fantastic! Just wondering if I could use soya cream in the ganache instead of oat cream or would this not work as well? I've been making wacky cake for some time now but this recipe is probably better than my usual. Very moist, not too sweet a bit fragile though. That's great! Glad it worked out for you, hope you like the vanilla cake too :-) Thanks for the comment! This cake looks amazing and yummy. 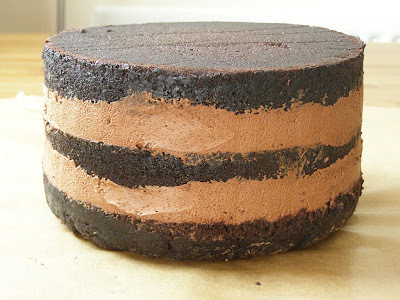 This looks amazing, such a good idea assembling it in the cake tin! Going to attempt this sometime during the week - will let you know how it goes! Wish me luck! Thanks! Sorry for the late posting of your comment here, hope it worked out for you if you've had a chance to make it! I've looked all over for a tall springform cake pan. Where in the world did you find yours? What's the brand? Your cake looks gorgeous, by the way! ...so it may have been an own label brand. You could use one without a removable bottom as long as you use extra strong cling film to pull it out. You could also assemble it on a plate using thick acetone sheets (used in chocolate making) to wrap around the cake and hold the mousse in. Hope you find something suitable! It resulted in a stiff mousse, which I had to spread with my fingers. I guess I understood it wrong?